The REI Flash Insulated Air Sleeping Pad arrived in its own stuff sack. No imperfections were found. I requested a size Long pad even though the specifications indicate that based on my size I could have used a size Regular. My request was based on the fact that I always seem to be hanging over the edge of similar-size pads when fully stretched out. The REI Flash Pad is an inflatable mummy-shaped pad that is insulated with synthetic insulation (2.5 oz/71 g). The size Unisex Long pad is a full 78 in (198 cm) in length by 20.5 in (52 cm) in width by 2.5 in (6.35 cm) in thickness. It packs to about 4 in/10 cm by 8 in/20 cm (my measurements). The manufacturer suggests that it could be packed to 4 in by 5 in (10.16 cm by 12.7 cm). That might be a challenge but I will try it the next time I fold it. The Flash Pad will easily fit into various bivy sacks as well as my tarptent as they all have adequate length to accommodate the long pad. Upon arrival, the pad was folded lengthwise into three parts and then rolled to fit in its stuff sack. There is an additional hook-and-loop strap that can be used to keep the pad from unfolding in the stuff sack. 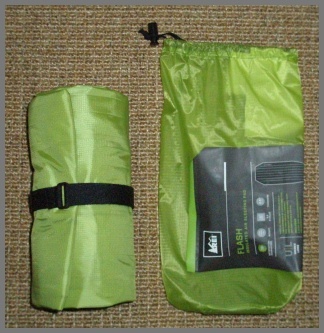 I find the stuff sack to be easy to use as it is quite a bit bigger than the circumference of the folded pad plus it is much longer than needed. There are two flat valves that control the inflation and deflation. I really was impressed with the one-way valve on the inflation as I don't lose any air if I take a rest from inflating the pad. It took me about 22 breathes to inflate the pad. To deflate, I simply opened the deflate valve and most of the air immediately came out. I re-folded the pad in thirds and starting rolling the pad and more air came out as I went along. I did note that it is important to roll the pad starting from the side with the inflate valve as the open deflate valve could then work to expel the rest of the air. The outside of the Flash Pad is 30-denier ripstop polyester with a polyurethane lamination. The materials are soft and not crinkly. These light weight but sturdy materials make an amazingly light pad (size Long only weights slightly over a pound (496 g). Although the material is somewhat slippery, REI has incorporated the linear outer edges of the pad to be slightly thicker to likely prevent rolling off. The pad itself is divided into eight air baffles, six of which are smaller and the two on the outside larger. Although the pad seems to be sturdy enough with careful usage (avoiding using it directly on the ground), I find that a repair kit would give me more comfort if it was included. They can be ordered as a separate item so I definitely will be doing that. Since many of my trips are lengthy in nature I have to depend on an inflated pad. Deflated, the pad would offer no insulation or comfort for that matter as it is totally flat. I'm heading out to use the Flash Pad for a one-night backcountry trip. In two months I will be filing my Field Report with details on that as well as other planned trips. 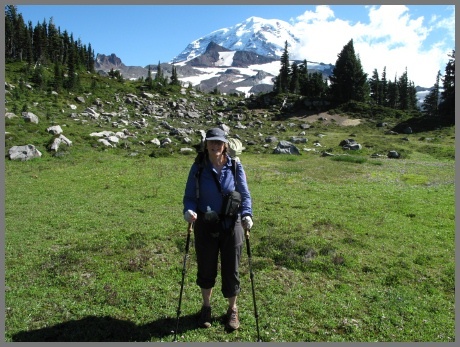 During the field test period I have used the REI Flash Insulated Air Pad during four backpacking trips totaling 21 days and 18 nights. Locations were in the states of Michigan and Washington, USA and ranged from lakeshore to mountainous terrain. Elevation ranged from above 600 ft (183 m) to almost 7000 ft (2134 m). 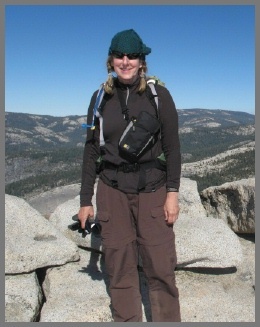 The REI Flash Pad was used extensively during the field test period for a total of 18 nights. I first took it out on an overnighter to check it out before I packed it for a very long trip. The first night of use was heavenly. My next trip during the test period was a rather long one totaling ten nights preceded by a night of car camping to stage for the backpacking trip. The car camping night was rather poorly prepared for in that I had a bunch of stuff in the tarptent that wasn't in a waterproof bag. I shared this tent with my sister so space was limited. An unseasonable amount of rain fell that first night and water literally blew in the mesh areas of the tarptent all night long. In the morning the entire floor of tent had to be mopped up with a microfiber cloth. Luckily my sleeping bag was dry due to being elevated by the Flash Pad. I hate to think what would have happened with a thin pad. Unfortunately a few other items in the tent got wet. The next day we started our long backpacking trip with a wet tent plus a few other items that were wet. It continued to rain into the next day and cold night so I was extremely thankful that I at least had a dry area to sleep on with the Flash Pad underneath me. Many of our days were lengthy during the first part of this backpacking trip due to a crazy permit itinerary. We often got into camp close to dusk several nights albeit starting early enough. I hurried to set up the tent and blow up the Flash Pad. Being fatigued it is not always the part of the trip I look forward to. However I was happy that the pad inflated so quickly with normally around 16-20 breathes. One evening I inflated the pad and the process was going slower than normal. I looked down and noticed that the other valve (deflate) was open...no wonder! Another time I noticed that the inflate one-way valve was losing air. I poked my finger in the hole to re-align the flap closure that had somehow become misaligned...simple enough. One funny thing that I should mention is that when the deflate valve is released it makes quite the sound of air rushing out. My camp neighbors kind of wondered what was going on the first time! During my third trip I experienced one of the nights being as low as 37 F (3 C). I wasn't cold at all which is unusual due to the fact that I sleep cold and I was using a 30 F (-1 C) sleeping bag (I normally need a sleeping bag that is rated colder at those temps). My guess is that the insulation of the pad had something to do with helping to keep me warm. The fourth trip resulted in three more nights of comfort which was truly important as I was sleeping with a very sore broken rib (incurred during a fall when trail running the week before). Needless to say I had more difficulty turning around on the pad but once I was situated my rib was thankful for the comfortable pad. Although I have used a similar but more expensive type of pad before, the Flash exceeds it on so many levels. The first thing I noticed is that it doesn't take as many breathes to inflate even though it is longer than my other pad. The one-way valve keeps the pad from losing air while inflating so it blows up so much faster. Next the material of the pad is not only quiet but non slippery so I am not fighting sliding off the pad all night long. The deflate button rapidly expels the air so I don't have to squeeze the excess air out of the pad. And not to be outdone the pad easily slides into the stuff sack provided with extra room to boot. And did I mention that the pad has lost no discernible air on any of my nights in the field. This is unbelievable to me based on experience with similar products. I never have to scour the camp site for small sticks or rocks that might lessen my comfort. Of course I look for anything sharp but don't bother to remove anything that isn't (especially when it is already dusk). 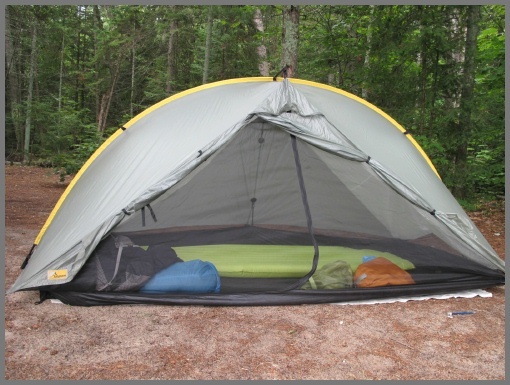 I have always used the pad inside a tent or over a ground cloth. I have slept on the nonsticky pad quite comfortably on hot nights with my sleeping bag used as a blanket. I also noticed that the slighter higher side tubes of the pad has kept me on it so nicely. I also am loving the length of this pad as I am testing a Long even though by measurement a Regular would have worked. The Long gives me enough space so that I don't have to worry about losing my small pillow or that my feet will hang off the end if I am not positioned correctly (well worth the extra ounce (28.35 g) compared to the Regular size. So far the pad has been easy to care for. I have used it inside of a tent or on a ground cloth so it has not become dirty. There has been no indication of a loss of air while using the pad or any other damage. It goes without repeating that I am truly impressed with this pad. I have used countless types of pads throughout my decades of backpacking and this one scores higher than any for many reasons. Thanks REI for the blissful sleep. I look forward to taking the Flash Pad with me on a few more backpacking trips in the long term period. The weather will be much colder so it will be interesting to see if I can take this into winter. 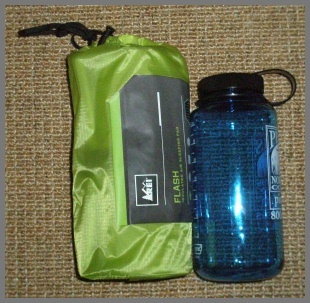 During the long term test period I have used the REI Flash Insulated Air Pad during two trips. 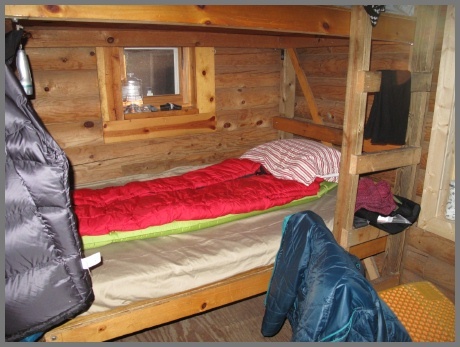 One was an overnight backpacking trip and the other was a four day sled-in rustic cabin trip. Additional usage totaled 4 nights resulting in 22 nights for the entire test period. Locations were in Michigan and ranged from lakeshore to boreal forest. Elevation ranged from above 600 ft (183 m) to almost 2000 ft (610 m). The first trip of the long term period was in colder conditions than experienced during the field period however the trip had no new precipitation. I slept on the Flash Pad combined with a 0 F (-18 C) sleeping bag and stayed warm throughout the long cold night. The pad was inside my tarptent which had a thin ground cloth underneath it. I brought a Z-Rest with me in case I needed more insulation but found that I was comfortable without it. 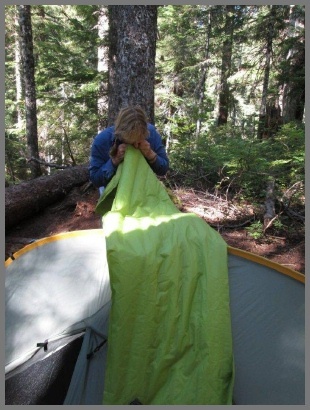 It probably helped to have a warm sleeping bag but I usually step up the insulation as I sleep cold without it. My next trip was a rustic log cabin trip. Very cold temperatures occurred during the entire four days. This solo trip over New Years involved skiing into the cabin that is heated by a wood stove. The "vinyl"-covered mattress in the cabin was historically not very comfortable so I decided to take the Flash Pad to place on top of it. My comfort was increased immeasurably over other times there. The cabin never had a temperature more than 62 F (17 C) the entire time I was there (due to extreme outside temps) and at night it went down to near 40 F (4 C) before the fire was nearly out (slept too well). I stayed warm on the pad even though I only had a 45 F (7 C) sleeping bag. I normally take this bag when I sleep inside the cabin but I was worried that it wouldn't be enough warmth once I got there and found that the cabin didn't heat up like usual. The latter is also due to a large window that had recently been installed on the cabin on a formally solid wall so heat was escaping. The REI Flash Pad has earned a permanent place in my backpacking kit. Not only is it super comfortable but it is non slippery and has elevated side tubes so I stay on top of it. The most remarkable asset is that I never have to blow more air into it after the initial inflation. That was incredible on this last trip when it stayed inflated for four days with no perceivable loss of air. I continue to love the length of this pad and will never go back to a shorter one. Upon inspection, the pad is still in perfect shape, the valves work quite nicely and the surface is unblemished. I still wish a repair kit came with it though as I keep forgetting to buy one. Luckily I haven't needed one! I sincerely hope that REI continues to carry this product for a long time because I have recommended it so highly to many people. 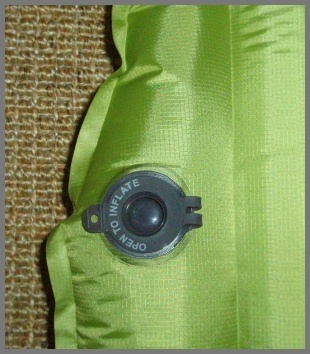 Thanks to REI and BackpackGearTest for this opportunity to test the Flash Insulated Air Pad. This concludes my Long Term Report and the test series.